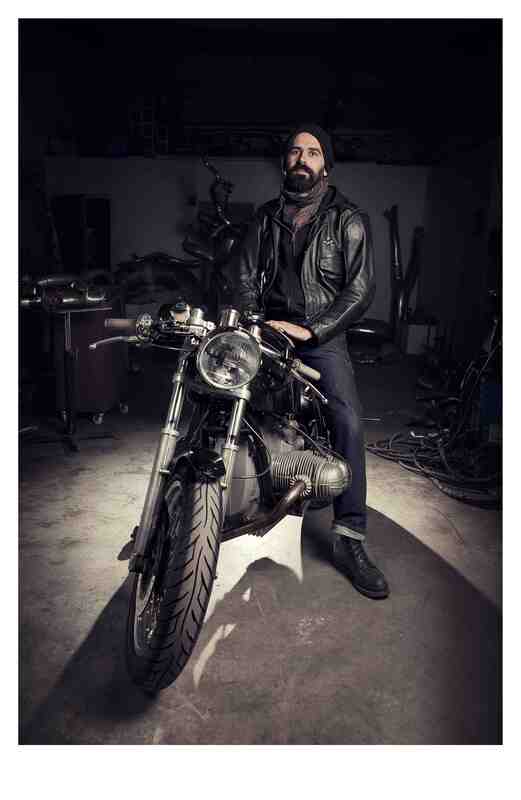 Sette Nero MC was created as a result of Andrea’s life time passion for motorcycles and all things design and Simon’s enthusiasm for creating works of art from metal. Andrea Felice is an Italian furniture designer-maker who set up business ( www.af-designs.co.uk ) in London in 2000. His limited edition furniture work often combines wood and metal and has been featured in many design magazines over the years. In 2003 Andrea decided to build a cafe racer based on a BMW R80/7 1978, beemers were not a popular choice for customizes back then because they were considered an “old man” bike with no guts. However he liked the BMW’s reliability and engine design so he went for it! Creating Biplano, his first custom BMW. He kept the bike for a while then decided to sell it to finance Sette Nero Manta (completed October 2013). In the process of the build he was helped by various people and trades, but mainly by long term friend Artist Simon Black. Simon Black is a sculptor who uses stainless steel as his main media and has developed various techniques of metal hydro forming. English born, Simon came back to the UK a few years ago after completing his Masters in Fine Arts in Canada. Since then he has been producing stunning work in his workshop in Deptford London which was next door to Andrea’s previous studio (and that is how they met). After Sette Nero Manta was finished Simon and Andrea were having a chat over a pint and decided that it was a shame to simply stop after all the learning process of the build. So they decided to carry on and form Sette Nero MC. Andrea first meet Melissa more than a decade ago when he had the workshop next door to Victory Motorcycles in Camden and she had friends who worked there and they all road down to the Coupes Moto-Legend at Montlhery. Originally from New Zealand, Melissa is a keen biker who loves her current Moto Guzzi cafe-racer and new Jawa project. She has had a life long passion for both classic bikes and vintage scooters, and has a small garage full. “Sette Nero” translates from Italian to “Seven Black” in English. We are currently working on our second project, currently shaping a new tank design, seat unit and a two into one exhaust system. We will keep you posted on the progress! Also, if you have a bike that you would like us to customize or would like to commission one (doesn’t have to be a BMW) please get in touch! We can work with you to create the bike of your dreams! Really sorry, have only just seen this comment. Glad you like the bike. Webbing is for performance and aesthetic …. hard one to answer. Really it’s up to you. I don’t use the stuff, but on the right bike it could look good. Colour, would depend on the colour scheme of the bike. Sorry can really give you any pointers on this one! Happy riding!